Choose ethnic art, decor and crafts gifting products for festive season in collaboration with leading designer houses exporting artefacts all over the world. These emotive creations are crafted by renowned design houses as a global work of art portraying the largest such collection. 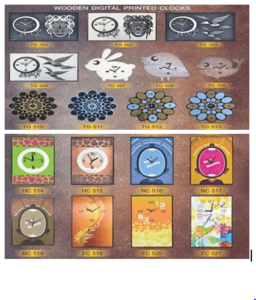 Each piece is an art collection crafted to perfection with elaborate research creating the right aesthetic effect and the technical precision. 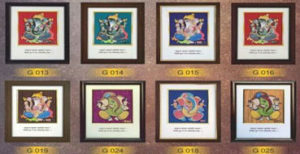 This artefacts collection presents the most extensive range showcasing a range of wooden printed 2D Ganesh frames, Ganesh wooden clocks, wooden digital printed clocks, digital printed wall pictures, canvas frames, camera frames, night lamp frames, key holders, trophies, wall pieces, yantra frames and various wooden articles such as tea coasters, laptop stand, boxes and desk calendars etc. 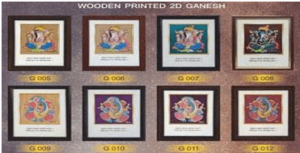 Wooden printed 2D Ganesh in frames as per images shown below: – Select from the various laser cut photo frames in various sizes. 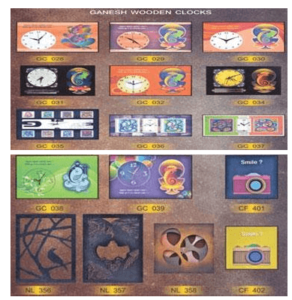 Ganesh wooden clocks, camera frames and night lamps: – Please select from the images below Ganesh laser cut clocks (GC), camera frames (CF) and night lamps (NL) with the respective part numbers. 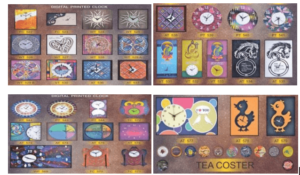 Digital wooden printed clocks in various shapes and sizes: – laser cut clocks, mixed clocks, table clocks, wall clocks and tea coasters. 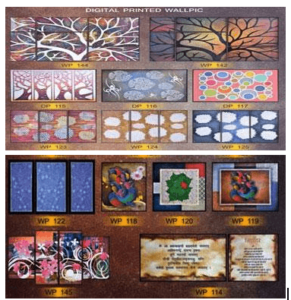 Digital Printed Wall Pictures: – decorative and wall pieces in various sizes and designs. 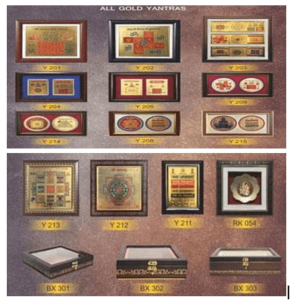 Gold Yantras: – Yantra frames available in six sizes 6×8.5, 6×9.5, 7×9, 9×9, 12×12 & 16.5×14.25 inches with fibre framing, paper card board, MDF with high quality digital printing ideal as Corporate gifts. Wooden boxes are available in 9×9 and 8×12 inch sizes. 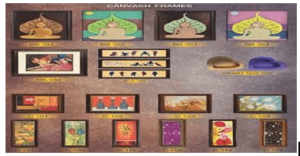 Canvas frames: – Choose from Buddha frames, heart shaped boxes, Radha Krishna frames and other canvas frames. Available in various sizes 6.5×16.5 x 3-piece set, 9×9, 6.2×16.5 inches with fibre framing, fabric canvas, MDF with high quality digital printing ideal as Corporate gift. 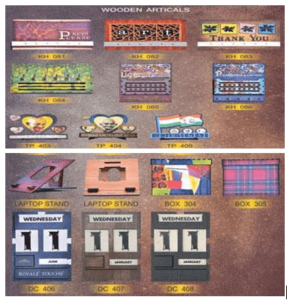 Wooden articles: – such as key holders or key chain stand with provision for letters, Gandhi Jayanti, Republic and Independence Day trophies, laptop stand, boxes, desk calendars etc. We are extremely delighted to find a way with you to jointly empower the artisans by keeping the traditional skills alive. Our journey so far has been successful and with your support, we can reach farther and create a greater impact.